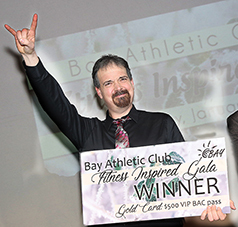 Above is Bay Athletic Club’s Fitness Inspired Gala Winner Tim LaFleche, who was voted most inspiring story of the year at the annual gala, held Jan. 19. Below are the honorees in attendance at the gala. Honorees were selected to be featured in the “60 Second Inspiration” segments on WBKB in 2018. That is a quote from one of the honorees at Bay Athletic Club’s Fitness Inspired Gala, held Jan. 19 at Fletcher Street Depot in Alpena. At the event, the club honored the 25 people who have transformed their lives through fitness and shared their story in a “60 Second Inspiration” on WBKB during 2018. Twenty-two of the honorees were in attendance and able to share more with the audience. One woman said she no longer wakes up hating the world. Another said she loves celebrating her birthday and wishes that for everyone. A man shared that he used to cry everyday after being diagnosed with type 1 diabetes, but fitness has increased his confidence and strength. A mom of three said she is finally the person she always knew she was meant to be. All of these people have transformed their life through fitness. At the end of the evening the audience got to vote for the three stories that inspired them most. The top five honorees were: Randy Welch, Tim LaFleche, Elijah Baker, Gary Armstrong and Casey Ross. LaFleche was voted most inspiring story of the year. He has lost 100 pounds and has gone from the party lifestyle where he covered up how miserable he actually felt with food and alcohol, to truly happy, he said. In his 30s, his doctor said he would not live to 40 if he kept up his bad habits. That was a wake-up call that started small changes and in time have added up to a fit, happy, grateful man. He won a $500 VIP Gold Card to Bay Athletic Club. BAC’s “60 Second Inspiration” stories air on WBKB 6 p.m. news on Mondays. For more information, visit www.BayAthleticClub.com or call 989-356-5600.